Apologia is described as a genre where the orator defends him/herself, his actions or decisions against an accusation. In other words, an apologia can be defined as a speech that justifies, defends or apologizes for an action or a statement by the person delivering the speech. An apologia is also known as a self-defense speech (Towner). 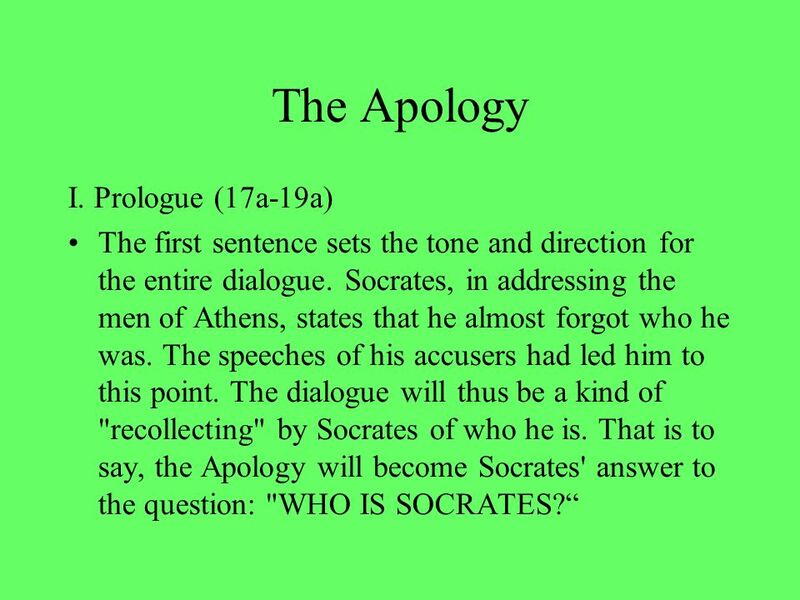 In Plato’s the apology, Socrates does not apologize but rather defends his stand to the jury. Rhetorical appeals necessary to an apologia. An orator makes a speech to not only put a point across but also appeal to the audience convincing them to believe or consider what he/she is saying important (Cahn and Steven). According to Aristoteles, there are three critical persuasive appeals to persuade the audience effectively. They include pathos, logos, and ethos. The three should be in line with the persona of the one giving the speech to persuade the audience. Aristotle (1954: translations by Robert) argues that the mode of persuasion by any speaker depends on his or her persona, then putting the listeners into a frame of mind he prefers and finally, proof of the words the speaker has said (Wang). Accusations Socrates defends himself against. In the Apology, Socrates is accused of not believing in the gods as universally accepted by his state. The charge is based on the fact that he rejects the prophecy made at Delphi by the Oracle claiming him to be the wisest of all men. With this, he is also accused of corrupting the minds of the young people in the state as he exposed the false wisdom and ignorance of the supposed wise men in the state. The actions of exposing the false wisdom earned him respect, adoration from the young Athens (Plato trans. G.M.A. Grube. Pp. 112.130). Socrates starts his defense by explaining that he is no expert in law and that he would speak in the manner he is accustomed to, which is direct and honest. He then proceeds to explain that his behavior originates from a claim made by the Oracle of Delphi, placing him on top as the wisest man. He validates his claim by stating that he was in deed the wisest since a wise person does not know everything and neither does he/she pretend to know. Socrates then goes on to interrogate Meletus, the man responsible for bringing him before the jury. The questions directed to Meletus at this point seem to have the intention of embarrassing Meletus rather than proving the truth of the matter. Socrates goes ahead and claims that without his influence, the state is deemed to drifting into a deep sleep with no virtuous actions or productivity (Plato trans. G.M.A. Grube. Pp. 112.130). How Socrates's defense compare to a modern celebrity's defense. Socrates case was based on the fact that he influenced youths to believe in his crusade of no one being wise and embarrassing most of the people in high seats of the state. The same thing can be said about Colin Kaepernick, an athlete who refused to stand during the singing of national anthem (Sandritter). In his defense, he was standing for the people of color. The athlete faced a lot of backlash from both the media and the public. He defended himself by saying that what he was doing was more important than even himself. Colin ganged a lot of support from fellow athletes just like Socrates got from the youths.